A few weeks ago, I stumbled over a new pressure cooker blog. Buried in a recipe for steamed burgers a last-minute addition of a ramekin of cheese really stole the show for me. Michael indulged my request for more cheese with this guest post. Apparently, he’s got talent away from his pressure cooker, too! Michael has played in punk rock bands, worked in the advertising industry and has been blogging for several years on the joys of commuting by bicycle in the car-centric City of Angels. As he likes to put it, a chance meeting with a shiny pressure cooker sent him on a mission to spread the virtues of pressure cookery through his blog pressurecookerconvert.com. A couple weeks ago, I was inspired by an episode of Man Vs. Food to make steamed cheeseburgers like those served by Ted’s in Connecticut. What do you do when you want a steamed cheeseburger but lack a specially made cheeseburger steamer? Why, the pressure cooker of course! 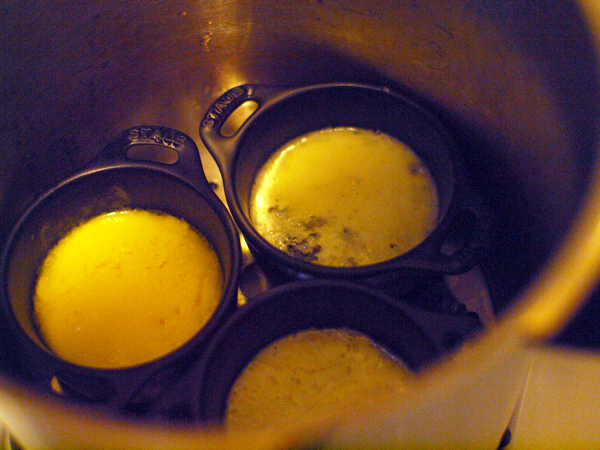 Rigging up a makeshift rack using a trivet to suspend a ramekin of cheddar above the burgers in the pressure cooker so I could steam the cheese along with the burgers like Ted’s, it produced a perfectly melted pot of cheesy goodness to top the burgers with. Wanting to see if it was just a fluke, I decided to take it a step further. This past weekend I went to the local Trader Joe’s, purveyor of reasonably priced cheese (among other things), and picked up a variety of cheeses. The purpose of this purchase was to see if this method would work with all kinds of cheese, or if I just happened to pick the perfect cheese the first time out. Did the results show that any cheese will work? Well, mostly but not quite. 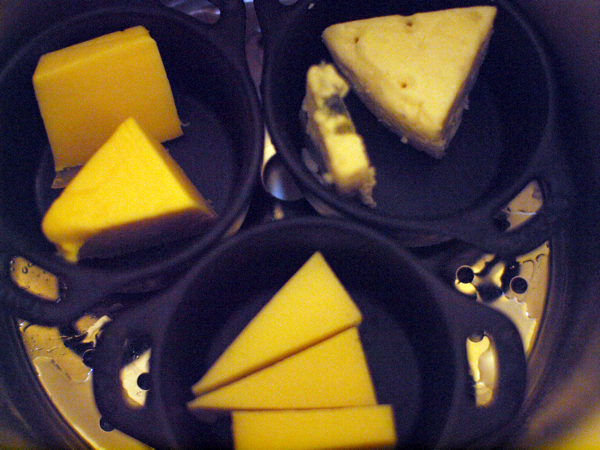 Since I could only fit three ramekins in my pressure cooker (just barely), I decided to test three different cheeses. I got out the Gruyere, Gouda and a Roquefort. Placing 2.5 ounces of each in a ramekin (I just cut it in chunks. Grating the cheese would probably work fine as well, but why do the extra work? ), I put them on the trivet in the pressure cooker with a half-cup of water. set it for five minutes and hoped for the best. When the timer sounded, I took the pressure cooker off the heat and let the pressure release naturally. Removing the top of the pressure cooker, I found myself peering at two ramekins of smooth, melted cheese… and one ramekin of gloppy, curdled-looking unpleasantness. The Gruyere was great. Perfectly melted with wonderful texture. The Roquefort rocked, although it probably would have been better with only two or three minutes of time since it seemed a bit more liquid than it should have. The gouda on the other hand, was not-so-gouda at all. My findings showed that most cheeses come out great using this method(three out of four worked well, including the original cheddar), so if you are making something that you want to add melted cheese to, go ahead and put a ramekin of cheese in with it! Let me know what type of cheese you used and how it worked out. Want to share your pressure cooker recipe or technique, too? Use the handy-dandy recipe submission form and let everyone know what is cooking in your pressure cooker! We only accept original recipes with photos. Such a great idea. It has me thinking of so many fun ways to use the cheese. might shed some light on your Gouda glops. And it shows a way to make almost any cheese steam to gooey perfection without splitting. Hint: Wondra Flour and a little extra dairy. Oh wow… I only skimmed the surface of the article and see that I need to dedicate some time to reading it. Absolutely fascinating. How To Make Any Cheese Melt Like American (Almost). Michael, fantastic guest post. You really went all out testing THREE more cheeses. Here is an article from Fine Cooking that might help the adventurous cooks reading your technique and might wonder if the cheese in their refrigerator RIGHT NOW might work. It looks like any cheese listed in the “smooth and flowing” might work. Your Gouda glops are a mystery – I would have thought for sure the Roquefort would have had problems (at least taste-wise) since it’s in the same family as Gorgonzola and you need to “just” begin to melt them to keep the most flavor. Thanks Laura, it was my pleasure! As for the Gouda, I was noticing later that it was labeled as a “double-cream” Gouda and now I wonder if it was just that particular Gouda and perhaps others would melt better. Incidentally, I did make fondue for dinner the same day that I did the cheese tests. I originally included it in my post, but removed it because I still need to adjust the ingredient proportions, but it was tasty, it just needs a little work. I’m surprised that No one’s mentioned fondue, yet! Something that definitely needs exploring. I tried this with some low-fat cheddar the other day. After 5 min. it was melting but not quite smooth… another 5 min. got it pretty smooth, though it was still pretty thick. Great site! I will try out some other cheese to see how they fare. What are those adorable little ramekins you have? Are they cast iron? Where do I find them!? They sell something similar here (Australia) as a “Prawn Pot”. They are cast iron but nowhere near as pretty as Laura’s. This was Michael’s recipe, not mine, but if I’m not mistaken he was using those ceramic Le Creuset mini cocottes for this! !